I made some vegan biscuits and gravy for Veggie Supper Club last night. Our theme was “Breakfast for Dinner.” We also brought a vegan version of Amish Baked Oatmeal (with fresh blackberries from our backyard) and sparkling white wine, OJ & grenadine for breakfast cocktails. :) If you stumbled in here from a recipe search; well, this blog is mainly music related, but here’s a past recipe I did: Spiced Biscotti. Mix three dry ingredients together. Cut in margarine until mixture resembles peas. Combine soymilk & lemon juice, and stir into dry ingredients until the flour clings together. Turn out onto a floured board or countertop, and knead until smooth. This was the trickiest part for me. I had my wife help with adding additional flour, as the dough was VERY sticky. Place on ungreased cookie sheet, and bake 12 to 15 minutes. Our biscuits turned out great… but sticky to make… so good luck!! The roux with unbleached flour worked fine. The spelt flour is probably better for you, or maybe lends a different flavor. Create the roux by combining the three ingredients and mixing until in a thick paste. Set aside. Using the olive oil, saute onion and garlic for 5 minutes on medium-high heat, stirring occasionally. Add mushroom and cook for 5 minutes, stirring occasionally. Add remaining ingredients except roux mixture and cook for 5 minutes on low heat, stirring occasionally. Add roux mixture and cook until gravy has a thick consistency, approximately 10 minutes, stirring frequently. If the gravy is not thick enough, you can add additional flour, but make sure to whisk it in slowly to avoid clumping. It’s a great recipe from the lovely Blossoming Lotus folks. And it worked great on the Chicago Diner biscuits… yum! made these for our thanksgiving dinner. got to enjoy the leftovers this morning for breakfast. put in our recipe box for all time. thanks so much! I’m cooking this right now, but I am curious as to why the picture shows a white gravy? Mine is clearly a brown gravy becuase of the soy sauce. Hi, I’m starting up a blog and began making rather varied articles for it. Would you mind if I blog about this? I will of course give you and this post due credit. Well I am a little late in the game here considering this was posted 2 years ago, but wow–that was delicious! Though I have to admit I did use a different biscuit recipe–it was similar. As for the gravy I was a little weary…I woke up craving “good ol” biscuits and gravy so I set out to find a vegan version. When I stumbled upon this I though ok, its worth a shot. I cut it in half (because the hubs does not do the ‘vegan thing’) and I omitted the nutmeg and cayenne (for lack of having any in the house). I did though add a TON of black pepper (a good Tablespoon) and also about 1/4 C. of vegan sour cream, it made the gravy more creamy and reminded me more of what I used to eat. I have to say after scarfing down 3 (with a bite here and there given to my children–they loved it) I am completely satisfied! I am full, the craving is cured and I feel a heck of a lot better than if I were to eat the “regular” biscuts and gravy! Thanks so much for the post! There is so much I love about this post! 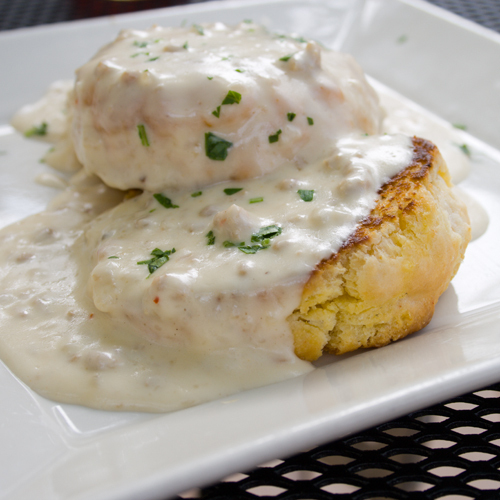 I DID find my way here via Google search for “vegan biscuits and gravy,” since I’m a former carnivore who’s now mostly pescetarian, but have been looking for a good veggie version of gravy! Also – I LOVE Chicago and will remember that recommendation and I’m moving TO Portland and will remember that yoga studio/restaurant recommendation as well! Awesome! I’ve never tried it with veggie sausage… I’ll have to give it a whirl next time. I *just* made it again yesterday with 3-4 pounds of chanterelle I foraged near home (Eugene, OR). Yummy with chanterelle as well as the original shiitake. 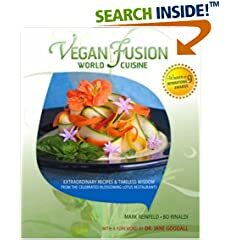 I have tried a number of vegan and veganized biscuit recipes over the years. I must say, this is the first that a recipe has come close to what I’ve been looking for!! We had them for lunch today with a to-die-for cashew gravy with Bac-un-bits sprinkled on top. Delicious! Glad they worked for you, too! I need to update. I’ve been doubling the roux size to get a better/lighter gravy when I make this recently. I added coconut milk creamer to recipe and decreased soy sauce but added salt and pepper and eliminated the cayenne and nutmeg. This made more of a white, “Country” style gravy to top my buiscuits with. Tasted very delicious!! Also, decreasing amount of veg broth is necessary when adding coconut milk creamer so that it thickens enough.